While driving the I-5 to Seattle, it is not hard to miss Burgermaster on the right hand side just past Burlington. 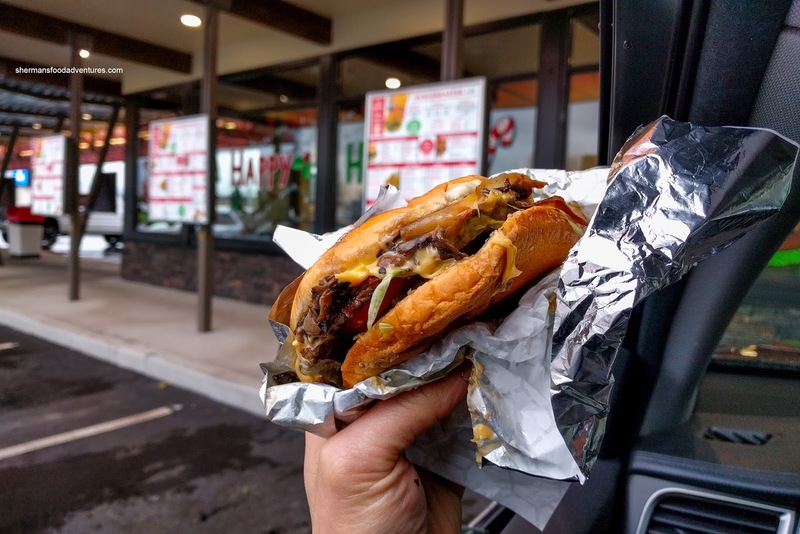 Occupying the old Cranberry Tree (that place was deserted so long ago...), Burgermaster offers up the classic drive-in burger experience with fresh grass-fed beef. Costanza and I put that down on our schedule for lunch on our drive home. 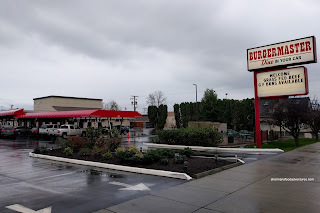 Somewhat similar to Sonic (but not) in Lynden, we drove up to a spot, turn on our lights and a carhop (wow, haven't used that word before!) was there to take our order. For Costanza, he went for the Mushroom Burger with a side of Onion Rings. 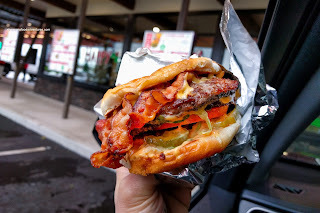 I'm not sure if the picture does the burger justice as it was greasy, messy, juicy and stuffed with sauteed mushrooms. We found the bun soft and somewhat malleable, which helped grip and keep everything inside. There was a good sear on the meat where it stayed moist and juicy. Lots of umaminess and Earthiness from the mushrooms. 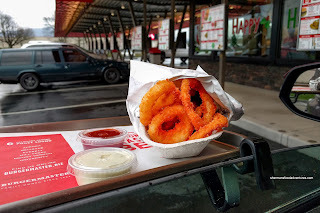 The breaded onion rings were fantastic being crunchy and not too thick. There was more breading than onion. For myself, I only had eyes on the Baconmelt consisting of 2 patties and double cheese. Again, there was a good sear which increased the pop of meat flavour. In addition, the ample crispy and lean bacon combined with the melted cheese made the burger a touch salty, but who cares, it was tasty! For my side, I got an order of the Fries which were crispy and slightly salty. 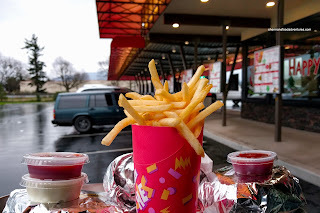 Since they were skinny fries, there was less potato texture left on the inside, but I still enjoyed them. In fact, I enjoyed my burger very much and it was far superior than the one I had at The Habit the day before. If you are driving down I-5, go ahead and give Burgermaster a try!